Hour of Venus; chart-ruler Saturn is Direct (good!) and not in 1st house (good!) 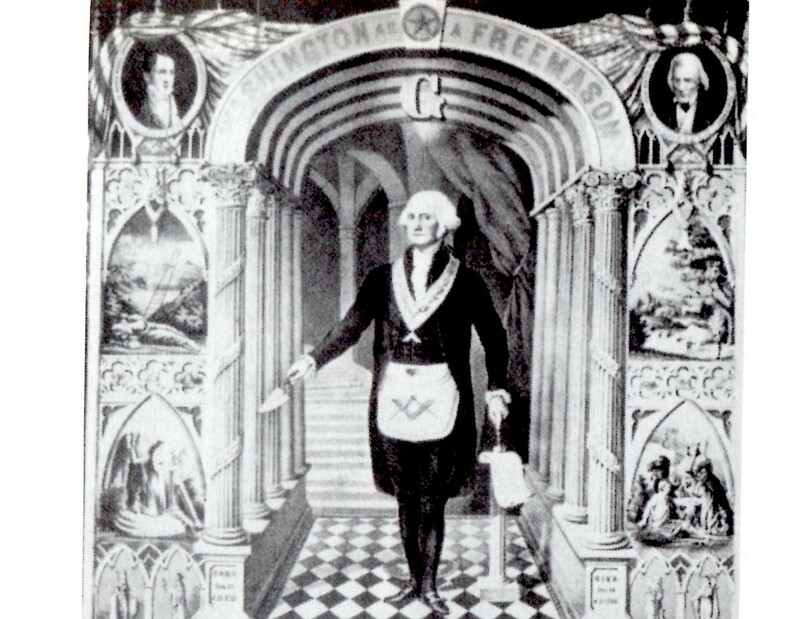 but rising before Mars and into 11th house while turbulently traveling across warrior Antares. Not what we want to see: a malevolent and karmic planet like Saturn (righteous-feeling in Sagittarius) less than a month past his meeting with testy Mars directly on Antares. A rowdy trio it was on August 24th. And you see Pluto conjoined with Vega in 1st house indicating events that are too powerful or unwieldy to deal with on a personal level. So here we have status quo, austerity demanding Saturn inhibiting, depressing, delaying who-knows-what-or-whom. Apparently, someone's ambitions will be delayed at best, not met if cards aren't played well. 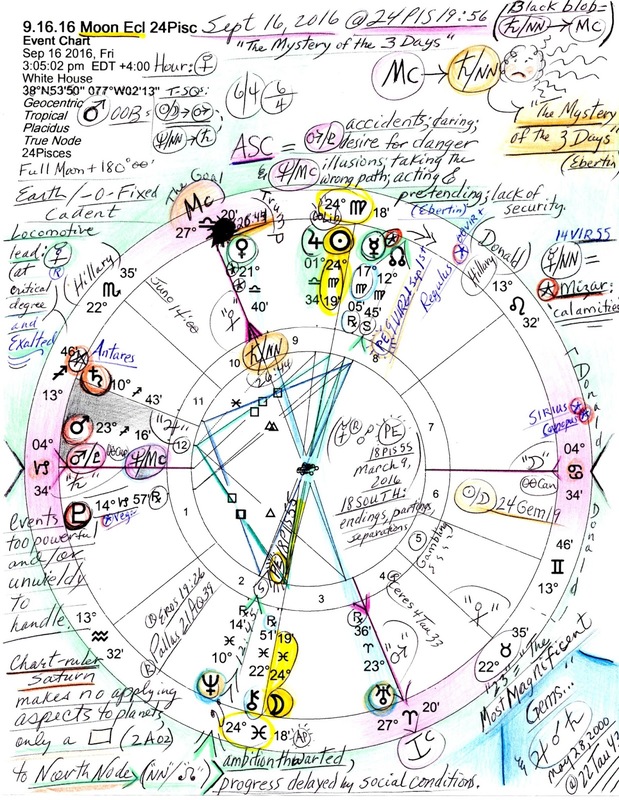 Yet no applying Ptolemaic aspects are made by chart-ruler Saturn so how things will proceed in this situation or for this event is more hidden in the chart than when chart-rulers apply to other planets (actors). When they do apply, some moderation can take place but here it does not. It seems that suspicious, violent, fiery, blind zealot Antares takes the all the cake on this banquet table. 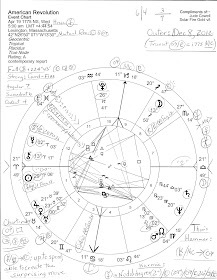 And the T-Square between the Sun-Moon (Full Moon) opposition squaring warrior Mars @23Sag rising in the 12th house of Politics, Large Institutions (ex: hospitals, zoos, prisons), Self-Undoing, Secret Deals, and Karma (reaping what was sown) desires ideas to come to fruition, unions to form, and sports matches to result for the athletes among us. Of course, when Mars scorches through Sagittarius, sign of the Seeker, the Arrow, and the Quest, we find those who are determined to convince others of their ideas and plans...a lot like a political campaign (Mr. Trump = Mars rising w/ Regulus). However, if the rising sign of Hillary Clinton really is Scorpio, ruled by Mars (w/ tones of Pluto underneath), she is indicated here as well. One wonders in mid-August if either or both candidates will be disqualified by September or sometime prior to the November 8th election/s! Perhaps we'll have a chance to appreciate the eclipse's Earth-Water blend of Sun Virgo-Moon Pisces for it is the relationship anchoring the energies of the day and is the main point, really. Virgo practicality is available to those who can deal with some truths sneaking into sober conversations as speedy yet retrograde Mercury at a critical degree of its own sign of Virgo (17:05) in the subconscious 8th house, draws near North Node and embraces Mizar, a fiery Mars-inspired star of calamities and turbulence which resonates with Antares and is supported by the Saturn-Neptune square affecting society's fears of loss, illness, weakness, and poverty. Another opposition chimes in: valuable (or perhaps vengeful) Venus opposes disruptive Uranus, the radical, at the MC-IC angles of Home-Security vs Career-Public Status. Venus-Uranus contacts suggests potentials for extravagance, eccentricity, and/or much tension toward separation which supports the Solar Eclipse themes here being re-activated by Mercury Rx. 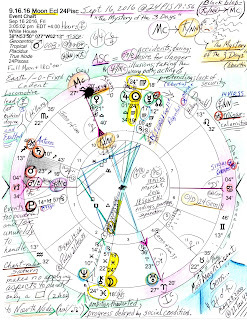 In the center of the chart you see that Mercury has been ruffling our previous Solar Eclipse of March 9, 2016 with its themes of endings, partings, and separations (Brady). 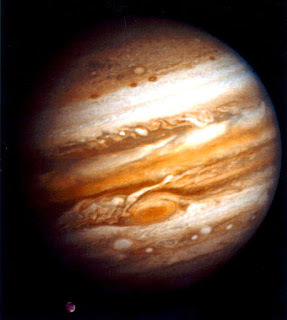 Sun and Jupiter huddle close but are 7 degrees apart and in dissociate signs (Virgo/Libra..."The Light of the Sixth Race Transmuted to the Seventh"?) with messenger Mercury ruling the Sun (Virgo) and Venus ruling Libra and thus, Jupiter. Salesmanship is going on. There are reviews of ideologies and pet theories, older ideas and criticisms though the Rx can also indicate repetition over and over (as they do in Politics). But maybe it's a case of Sales-womanship being more persuasive to the masses come November. Hillary has vulnerabilities, that's certain, but how much more out-there can Mr. Trump pretend to be? If selected president, he'll don W's cowboy hat and assert that he "has a mandate" to be as brash as he has whim to be. And the good he may do will soon be outweighed (see Canopus w/ Sirius in 7th house) by the bad. But there's another reading of the Sun-Moon opposition: leadership (Sun) opposing the Moon (We the People) which is where the Sun-Moon blend comes in handy for this combo of energies tends toward compassion, refinement, and modesty (which can't be Trump though he was born under a Gem-Sag Full Moon). One mustn't become swamped by details even is the forgotten is remembered but continue to see as wide a picture as possible so that insights will have the broadest application wherever appropriate. Altogether, difficulties and endings of various sorts are shown in the Lunar Eclipse along with the awareness and fulfillment vibes always described by Full Moons. This one happens to be a Lunar Eclipse and we see that unconscious and subconscious forces are rising to awareness and remembrance in order to grab their due. And I'm not certain that The Mystery of the Three Days (Saturn-NN) at Midheaven (the WHY? or Goal Point) will allow anyone enough time to sort it all out before October rolls around and leads the American people down another political primrose path toward filling the same old script-reader role in the Venusian Oval Office of the White House--whether it's a Madame President or a Mister. 9.16.16 Update: is Hillary Clinton's natal Pisces Moon being affected by today's Lunar Eclipse? Perhaps pre-affected in the last week with her health concerns and pneumonia diagnosis? There were 3 days from her diagnosis on Friday Sept 9, 2016 and the 9/11 ceremony on September 11th when our power-through Scorpio candidate fainted or was wobbly kneed.